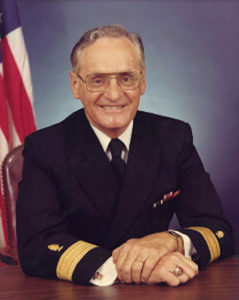 Rear Admiral Lewis “Red” Eugene Angelo was born in Forestville, (Butler Co unty) Pennsylvania, on February 18, 1928. He was the youngest of 19 children born to Italian immigrants Tony and Mary Angelo. His father worked in the limestone quarries. Lewis grew up in a poor family. They moved to New Castle, Pennsylvania, in the early 1940s. “Red” played football for New Castle High as a guard, graduating from there in 1947. Angelo enlisted in the Navy in 1948 where he was selected for specialty training with pharmacist’s of the Naval Service. Rising above the ranks, he became Ensign Angelo, a commissioned officer in the Medical Service Corps in 1958. Six years later, he graduated from the Naval School of Hospital Administration, and received his Bachelor of Arts (1964) and Master of Arts (1965) in management from George Washington University. In 1982, he became the Director of the Medical Service Corps and was the first Medical Service Corps officer elected for flag rank. Previous assignments included the Naval Hospital, Philadelphia; Second Marine Division, Camp Lejeune; Naval Hospitals, Saint Albans, Long Island, New York and Chelsea, Massachusetts; the Bureau of Medicine and Surgery; Office of the Secretary of Navy; Commanding Officer, Naval Medical Data Services Center, Bethesda, Maryland; Naval Medical Command; and Office of the Chief of Naval Operations. While serving as Director of the Medical Service Corps, he also served as the Deputy Commander for Readiness and Logistics, and Deputy Commander for Personnel Management. Admiral Angelo received the Legion of Merit, Meritorious Service Medal with gold star, Navy Commendation Medal and the Good Conduct Medal with two bronze stars. He retired in 1987 as Director, Medical Service Corps, Office of the Chief of Naval Operations and Deputy, Director for Personnel, Naval Medical Command. He was awarded the Silver Medal Award by the American College of Healthcare Executives in recognition of his lifetime professional achievements as a healthcare executive. Beginning in the 1970’s, the Navy Medical Service Corps officers met annually in conjunction with the American College of Healthcare Executives Annual Congress on Administration. The symposium focused on providing current military healthcare information to Navy medical department officers. Upon his retirement and in recognition of his support, the Navy named the symposium the “Rear Admiral Lewis E. Angelo Professional Symposium” (LEAPS) as well as that of the award which it bestows every year. He married Mary Alma Smith of Philadelphia. They had five children: Louis Eugene, Mary Ellen, Regina, Mark Anthony and Charles William. He died February 2, 2011 and is buried in Rockville, Maryland.